Forest Room cocktails. 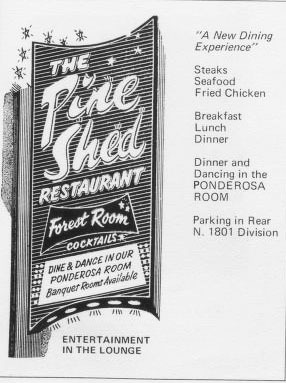 Dine & dance in our Ponderosa Room. Banquet Room Available. Entertainment in the Lounge. "A New Dining Experience" Steaks, seafood, fried chicken, breakfast, lunch, dinner. Dinner and dancing in the Ponderosa Room. Parking in Rear.